Image caption Kingsley Black said the surface was good for "sharp passing football"
Luton Town fans have gathered for a 'plastic pitch reunion' - 21 years after the club stopped using the artificial surface at Kenilworth Road. 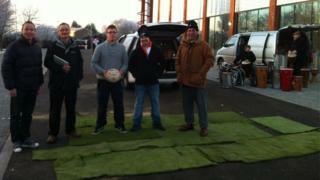 Supporters who had bought, or stolen, part of the pitch were asked by BBC Three Counties' Breakfast Show to congregate at Luton Sports Village. A handful of people turned up, including Neil Bavister who admitted stealing a penalty spot. "I think we got away with it - 21 years later we haven't been caught," he said. The artificial surface was installed in 1985 but removed in the summer of 1991 following a ban from the Football Association. The final match was a 2-0 win over Derby County. "All the fans ran on the pitch and took all the bits they could around the edges," Mr Bavister said. "We waited for the police and stewards to clear, went on with a sharp implement and hacked it out. "It's now up on the wall - a lot of memories." Other parts of the pitch were sold on by the club itself, some went to Whipsnade Zoo and a large chunk was given to Ray Paton, who recycles artificial surfaces. Former Luton midfielder Kingsley Black joined the supporters and admitted taking a piece of the turf back in 1991. "When they were taking it up I thought I'd have a small piece," he said. "I think I'm now going to have it as a mat in the front porch." Mr Black said the surface encouraged "quick, sharp passing football" but was painful to slide on. "They embedded a lot of sand in it, so if you were unfortunate enough to make a sliding tackle the sand could get in the cut and rip you like glass. "I've seen some nasty wounds." Luton Town's historian Roger Wash said the artificial surface had been widely praised on its introduction, as it was "a lot better than QPR's surface which had already been down four years". "It was only about a year later when we started beating teams like Liverpool and Everton, who were the top two teams at the time, and Kenny Dalglish and Howard Kendall started moaning about it that gradually it turned. "[Kenny Dalglish's] side were beaten before they got on to the pitch really because he was moaning for a fortnight beforehand. "But Luton's home record over the six years they had the artificial pitch was no better or no worse than it was before."